NASA.gov as seen on July 1, 2013. The online portal to all things NASA — NASA.gov — has a new look as of today (July 1), with a lightened color palette and new navigation tools. Among other changes, NASA has added a new window on the top right to highlight live events and upcoming news. "When we solicited feedback on what people wanted from NASA.gov, the most-popular idea (among those we could actually implement) was to make live events more prominent," Brian Dunbar, internet services manager at NASA's Office of Communications, explained in a statement. "So here is where we'll be putting links to launches, major press conferences and speeches, planetary encounters and anything else we want to draw your attention to." 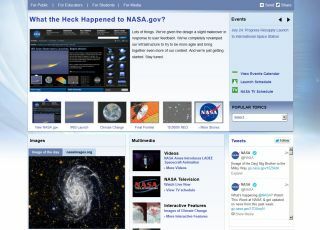 The new live events box has replaced a menu of icons directing visitors to NASA's popular topics, such as space station, solar system, commercial space, and universe news. Those channels are now available under a small drop-down menu below the live events module. The space agency also plans to integrate social media into its online features more closely. Most noticeable among the changes is the new look and feel of the site, which has gone from a black, grey and blue color scheme to a white and blue one. "We hope this will address some of the complaints we've had about clutter and the page being hard to navigate visually," Dunbar wrote. The site is a popular destination for space followers, and has been honored with numerous awards. In 2012, NASA.gov won the People's Voice Award as well as the Judges' Award for best government site in the annual Webby competition. Check out NASA's new website design on NASA.gov here.